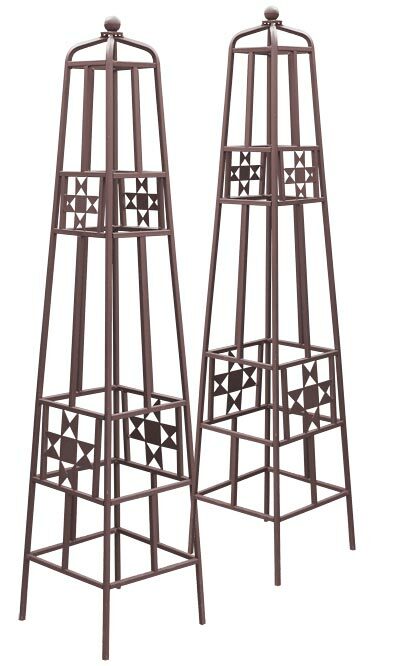 Bring your love of quilt patterns to two corners of your landscaping with these Panacea Rust Rustic Farmhouse Quilt Obelisks. Placing these vertical structures in your garden lends wonderful height and individual style to it, and their brown color enhances the natural look. The hardy, square metal bars form robust accents, and their precise angles perfectly contrast the curves of your plants. Four squares adorning the body of each unit hold an Ohio Star quilt block pattern, bringing a patchwork effect to the pieces. Their 10.75" square bases offer a stable support, and the four, 5.25" long legs on each enable you to stake the items in soil or a large pot if desired. The lasting, all metal construction keeps these obelisks beautiful for many seasons, and the brown finish on each protects them from the elements. Showcase the strength of the pioneers in your backyard with these Rust Rustic Farmhouse Quilt Obelisks. Note: This case pack includes 2 of the Panacea Rustic Farmhouse Quilt Obelisks, Rust, 48". Achla Lattice Obelisk, Black, 67"
Arboria Pyramid Cedar Trellis, Natural, 81"
Arboria Manhattan Cedar Obelisk, Natural, 56"